Looking for the classic engineer style boot that is waterproof? This will be one of the few! These boots are make with a leather upper and and a nice padded breathable lining. The boots have an integral Hipora waterproof liner installed between the leather outer and the inside lining that will keep water out, but also maintain breathability. The boots open/close with an inside zipper which is handy for pulling them on and off. I find the heel cup and toe cap to be sufficiently reinforced. The sole is thick, but could be better stiffened in the shank area. But a simple sole design like this is typical at this price point so I can’t complaint too much about that. 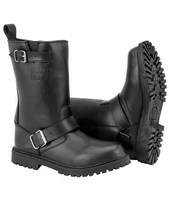 Black Brand says: The classics always last and these Thug boots demonstrate just that. Engineer style with the reinforcement that matters for riding. D30® insoles offer all-day comfort.